What Is An HTML Title Tag? Difference Between HTML Title Tag And Meta name="title"? What Tools Can We Use To Check And Craft Good Page Titles? Do We Have Control Over How Titles Are Displayed In Search Results (SERPs)? Boilerplate Titles? Should They Be Avoided? Does Google Penalise Keyword Stuffed Title Tags? What Is An Optimal Format For A Page Title? What are Tips (Step By Step) For Crafting A Great Title For SEO? Tip: Curiosity Killed The Cat! Or Precisely, "Curiosity Killed The Pagerank"
Here we are in 2018 and Search Engine Optimization (SEO) for a website is more of an uphill struggle than ever before. It's more difficult now, if you are looking for overnight success or looking for shortcuts. An SEO can make or break your website and we still don’t have any degrees in SEO. The truth is, there are no shortcuts in SEO. Ranking your page with Google is has to do with satisfying than 200 ranking signals, many of which we don't even know about and can only guess. There is a consensus though that a page Title has been and is one of the most important HTML elements to be worked on a webpage. Ttle tag remains "the most important" On-Site SEO task for any SEO expert. QUOTE: "Page titles are an important part of our search results: they’re the first line of each result and they’re the actual links our searchers click to reach websites. Our advice to webmasters has always been to write unique, descriptive page titles (and meta descriptions for the snippets) to describe to searchers what the page is about." QUOTE: "Titles are critical to giving users a quick insight into the content of a result and why it’s relevant to their query. It's often the primary piece of information used to decide which result to click on, so it's important to use high-quality titles on your web pages." HTML Title tag displays a Title for your page in search engine results. Title tags are used to inform both, your visitors and search engines about the purpose of your content in a concise, honest and accurate way possible. In a web page, an HTML Title tag is very important as it acts as an introduction for the piece of content that follows. It helps both your readers and search engines to make sense of your content. Your HTML Title tag is what mostly (Not always, will discuss this later) appears in search engine results pages (SERPs). Titles are crucial for usability and Search Engine Optimization (SEO). First of all, it's only the "title" tag here that is the required HTML element, when looking at W3C Compliant Markups. title tag is just meta data content, and different crawlers will use or not use that information as they see fit. In the case of Google, it very seldom, if at all, ever uses this tag for its indexation purposes. Fast forward again to the "h1" tag, and its use is also W3C recommended. So you can see the trend here - Google will look at the W3C elements and consider them for indexing more than the "title" tag. To put it bluntly, the "title" is a waste of code. If you want a certain phrase to be indexed, considered, or to show up in the SERP, I would add it to your "title" tag and remove the"title" altogether, to reduce the clutter and any chance of conflicting messages. QUOTE: "The goal of the snippet and Title is to best represent and describe each result and explain how it relates to the user's query." We use a number of different sources for this information, including descriptive information in the Title and meta tags for each page. We may also use publicly available information, or create rich results based on markup on the page." The page Title is often used, if not always, by Google to display results in Search Engine Result pages (SERPs). Keywords in the page Titles matter a lot. Right keywords selection can help your pages rank higher with Google. Keywords which have higher search volumes and are relevant to your content can boost your rankings in honestly crafted Title tags. Historically, the Title tag used to be an easy way for search engines like Google to make sense of the topic for the content. This is one of the reasons why Title tag was extremely manipulated to rank higher in rankings by SEOs. As Google evolved it included many other factors in its evaluation mechanism like uniqueness, originality, freshness, E-A-T of the content etc. In 2018, Titles stuffed with keywords, are misleading, are irrelevant to the content even can get your pages marked down and may completely be excluded for Search results. "Make sure every page on your site has a title specified in the title tag." "Page titles should be descriptive and concise. Avoid vague descriptors like "Home" for your home page"
"Avoid keyword stuffing. It's sometimes helpful to have a few descriptive terms in the title, but there’s no reason to have the same words or phrases appear multiple times." Your Title tag is displayed in the top pane of your web browser of the tab which is holding your page. The web browser displays your website logo followed by your Title tag. This feature is crucial. These days, visitors have many tabs open at the same time. Visitors can easily loose track of an open page. If your page is left open in the tab, It means there is something for your visitors for which they would like to come back for. If you have a practice of placing Important keywords at the start of the Title tag, these keywords would be prominent and help your visitor when they come back looking for your page. Social networks use your Title tag to determine as what to display when someone shares your page. Most social networks now have their own meta tags. In this age, different Tiles work differently on different platforms. For example, Facebook uses open graph protocol which allows you to control what content shows up when something is shared on its platform. You can read more about it at here: What are Open Graph tags? By using View HTML Source Code: Using the Google Chrome browser, right-click in an HTML page and select "View Page Source" ( for IE - View Source). In the window that opens use CTRL + F and types HTML tag, you are looking for "h1" - "h6". By using Inspect an HTML Element: Using the Google Chrome browser, right click on an element, and choose "Inspect". This will open a side panel and you will be able to view both HTML and the CSS for that element. Another very small Preview tool, I often use is SERP snippet generator. This tool provides a few extra features by adding rich snippets information into your SERPs preview. Though Google mostly uses your Title tag (provided it serves the purpose) but also uses its own Algorithms to decide what best suits as a title for your page. And many times, Google goes with its own mind. This is frustrating, we know, but there's no known way to force your Title in SERPs results. There are a few reasons (guessed by experts) as of why this happens. Google strictly advises against keyword stuffing. Repeating same words or phrases multiple times or adding too many different keywords which are not relevant to the content that follows will make Google drop your provided Title and use its own, rewritten Title. Many times your content will be relevant to the search query but your Title won't. Every human mind is different in translating requirements into the language. 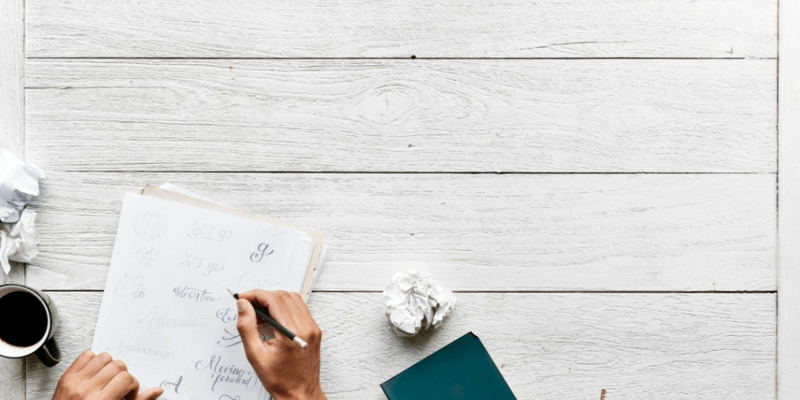 There might not be anything wrong with your Title but people might be using different phrases to search for what you have to offer in your content. Google algorithms may choose something else from your content like subheadings or even phrases from your content or restructure your Title using same words or rewrite it all together so it makes more sense to the users. This is not necessarily a bad thing. If the other ranking signals, Google uses are positive for your page, Google will not mark your content down. Remember. Most content creators are not SEO experts, like academics, doctors, students and the general public. As I said, not all content creators are SEO experts. And we all make mistakes. If your Title tag or HTML is broken, Google will attempt to figure out a Title from other subheadings or even content. Use tools like Screaming Frog and Google Webmaster Tools to check your Titles are correct and all in place. There is no definition of a perfect Title. There is a perfect process though, that you can use to craft better titles. Use necessary tools, do your keywords homework well and experiment more. Most importantly, follow Google guidelines. If you have recently updated your Title for optimization, Google might not have come to know about it because it might not have visited your page after your update. It may be the case that Google is using cache version of your page. Google takes a snapshot of every page it visits, in case the page isn't available on the server. Check the Google CACHE link and get it fixed from there. As of 2018, Google uses over 200 signals to help create a search snippet Title. 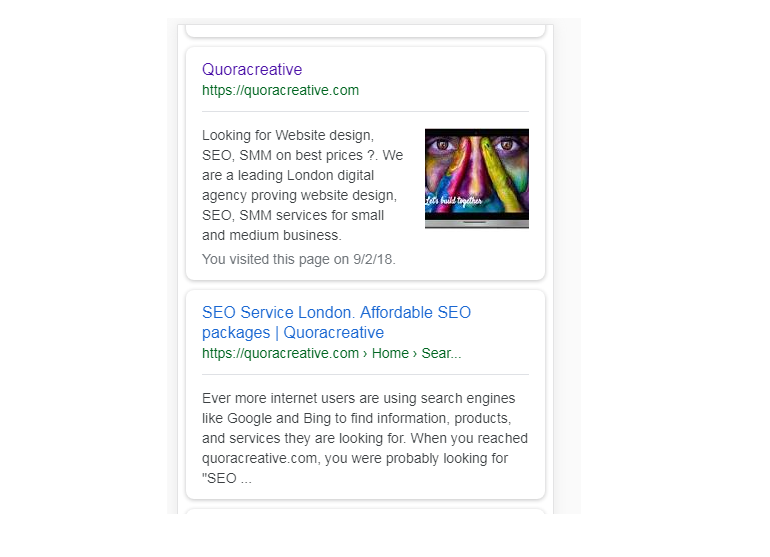 It may use other elements on your page like META Description or even the information like "Anchor text" from backlinks to your page from other sites. To summarise, We do not have that much control over what will end up as our Title in Search Engine Result pages (SERPs). With smart Algorithms in place, Google will often create a Title for your page. Remember, It has much more information in hand to make this decision, in fact, a better decision. Many sites have hundreds if not thousands of pages. Aprat from the Blogs and articles no one can spend hours crafting Titles for products ans services they offer. Even if you have thousands of pages, you can still automate your Title tag generation by following qualty guidelines. Do not forget the honesty rule ever. If you are selling point is cheaper products than your competitor, use enticing kewords, like "Cheap", Affordable, bargain etc but only if you are cheaper. A BOILERPLATE TITLE is the one with similar keywords in it, repeated over and over across other titles. Boilerplate titles can become ambigius if Google decides to omit boilerplate kewords from them. Title #1: "Keyword 1 - Keyword A - Some text | Brand Name"
Title #2: "Keyword 1 - Keyword B - Some text | Brand Name"
Title #3: "Keyword 1 - Keyword C - Some text | Brand Name"
Title #1: "Keyword A - Some text"
Title #2: "Keyword B - Some text"
Title #3: "Keyword C - Some text"
As we can see, removing boilerplate text; "BEST Price" and "from Mycarseats.com" from the title can make it a completely different title. If "Best Price" happens to be your high volume keyword, if combined with Keyword 2, to form a long-tail high volume keyword, removing it completely kills the titles off. Along with if Google algorithm sees duplication and categorize it as duplication there is a chance of your page being marked altogether. This doesn’t mean you cannot use repeat keywords at all. Maybe 15 of your pages are a slightly different version of the same product you are selling, like maybe Samsung smartphones. so that even if your boilerplate words do get truncated, your title still gives out a correct message. It might be a good step for a search engine to ignore the boilerplate text when indexing pages or using the content of pages to create query suggestions for someone using a desktop personalized search. Ignoring boilerplate in the same documents could be helpful when using those documents to rerank search results in personalized search. It is good to have your brand name included in the title but only on your homepage or landing pages for subdomains. Google will know about the importance of your brand as a keyword and will adjust if it finds using the brand as a keyword in another title for other pages makes any positive difference for user satisfaction. Title: "Latest articles from the author"
Title: "Latest articles in the category"
Title tags must honestly and accurately describe the content that follows. A page title that is relevant to the content that follows, will improve reliability and user experience. User experience is what Google is shifting towards. You need to adopt SEO accordingly. Google is all about ‘user experience’ and ‘visitor satisfaction’ in 2018 so it’s worth remembering that usability studies have shown that a good page title length is about seven or eight words long and fewer than 64 total characters. Longer titles are less scan-able in bookmark lists, and might not display correctly in many browsers (and of course probably will be truncated in SERPs). Do your homework properly to figure out what keyword is used in search queries which best describe your content. Use them wisely and apply a balanced approach. Strickly avoid Keyword Stuffing. Keyword stuffing is taken seriously by Google and in some cases, there is a chance of your page and even website getting penalized for doing it. sometimes you will need descriptive titles, sometimes brief. It is better to focus on what is necessary to introduce your content than on tips and tricks. If you want your content to stay permanently on top of search results, avoid catchy and manipulative and sensational titles. Such titles do help you for short time but Google learns quickly from user behavior when they end up on your page and leave soon(Bounce rate). Google learns, what is on the cover is different from actual content. Google now plays by "don't judge a book by its cover"
Titles are static and fixed, search queries are not. Experiment with your titles more. See what works and what doesn't by rewriting them. You shouldn't be done with one title. Keep on researching more about search queries trends. Interest change with time, use of language evolves, especially in this time and age, things change fast. The keywords which are relevant today may change in a few months time. Your content and titles need to evolve as well. A page title that is highly relevant to the page it refers to will maximise usability, search engine ranking performance and user experience ratings as Google measures these. It will probably be displayed in a web browser’s window title bar, bookmarks and in clickable search snippet links used by Google, Bing & other search engines. The title element is the “crown” of a web page with important keyword phrase featuring AT LEAST ONCE within it. Did you know you can use a different headline as HTML tag h1 than your HTML META Title tag? Use this approach variety of keywords to target and to add more phrases to the information Google can use match with search queries. It is important to keep the important title keyword(s) at the beginning of your title followed by less important ones after that so your most important introduction about your content gets delivered. You should try to use the following format when writing your page title. There's no exact character limit by Google. Currently, the space for a Title is maxed at 600 pixels. Characters can vary according to the device and available screen dimensions. If you keep it under 60 characters, chances are you will be able to get your desired Title properly is SERPs. 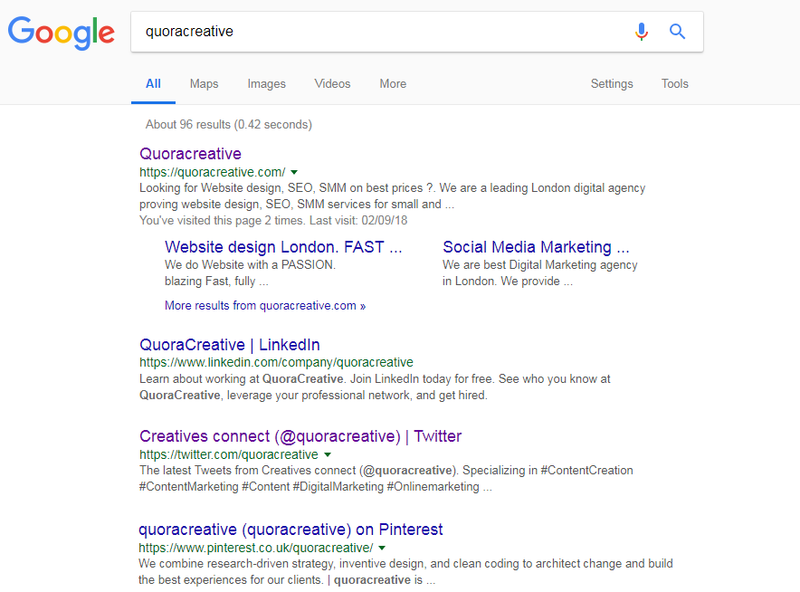 This is how Google displays query results for quoracreative.com. As you can see, Google is presenting longer page Title snippets to mobile visitors. Alongwith, It is diplaying DESCRIPTION META TAG in larger, more readable fonts. There are more type of devices than ever with internet access and it is hard to work out what will be diplayed. There is no one-size-fits-all rule as of 2018. If you were about to experiment only with keywords, I'll strongly suggest, first you put your sleeves up and come up with something worth presenting to your visitors which could add value. now it's time to look for an awesome tile tag for your content. And if you have your content is ready, let's move to the next step, THE KEYEORDS. The bedrock for great content marketing is great content. Always focus on targeting your topics over keywords. If you have well-structured content into subtopics, your content is going to rank not only for your primary keyword but for lots of other long-tail keywords as well. When you add up rankings and traffic for other long-tail keywords for your page you will notice that these bring you more traffic than the primary keyword you might be targetting. Consider this example of an awesome article written by Shaun Anderson : Link Building: How To Build Links To Your Website in 2018. This article ranks for many long-tail keywords which have over 100 searches a month. The really great about this page is, it ranks for a total of 1,262 ranking keywords most of which are long-tail and have fewer searches per month. 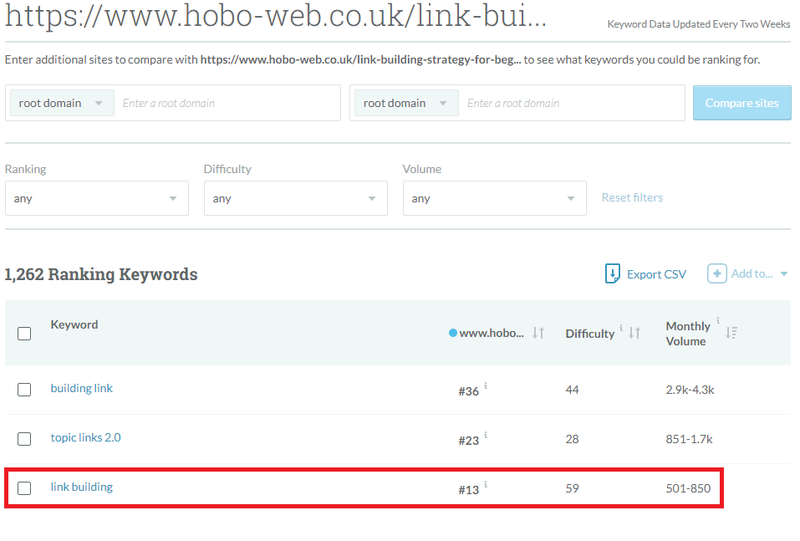 But If you do the maths, this page gets more traffic from non-primary, long-tail keywords than primary keywords. That is awesome. That's how Google sees your content and ranks it in 2018. All long-tail keywords in your content which could be ranked, get scrapped, then content and keywords analyzed together and listed. There is no magic formula. It is all about High Quality content. I hope you understand the importance and beauty of focusing on content and the topic rather than just the keywords. Above table clearly proves that high quality content and the topic are more important than keywords. You need to figure out what keywords best describe your content in the wider context. Come with few of them and write them down. Let's go to Moz Keywords Explorer and see what pages are ranking for these keywords, what are their monthly search volumes, what is the competition and the possible alternative suggestions. You will notice below that keyword combination has a monthly volume of 6.5k-9.3k . Lets try to analyse this page further using the same tool. Moz Keyword Explorer lists all the keywords this page is ranking for with rankings data. 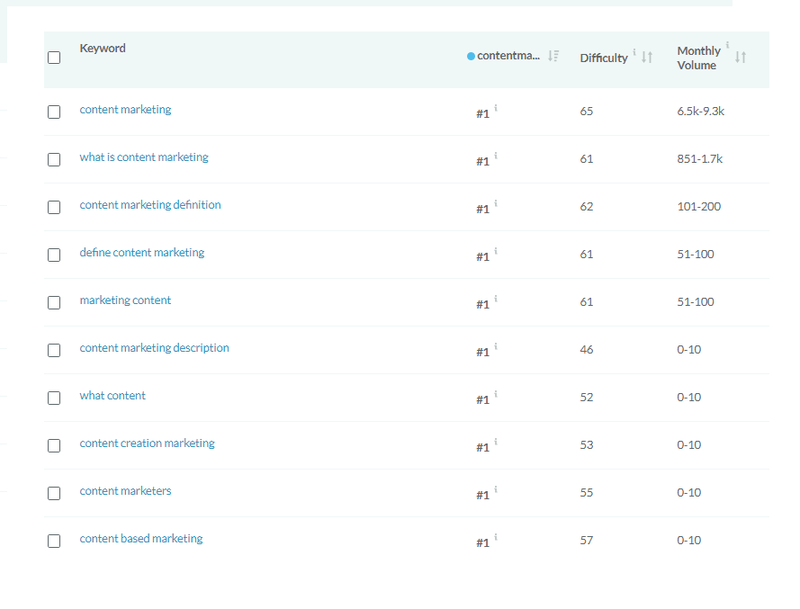 The same Moz tool gives you the option to see other keywords ranking similar to your main keyword. You can order the list by most relevant or by most traffic / Month. 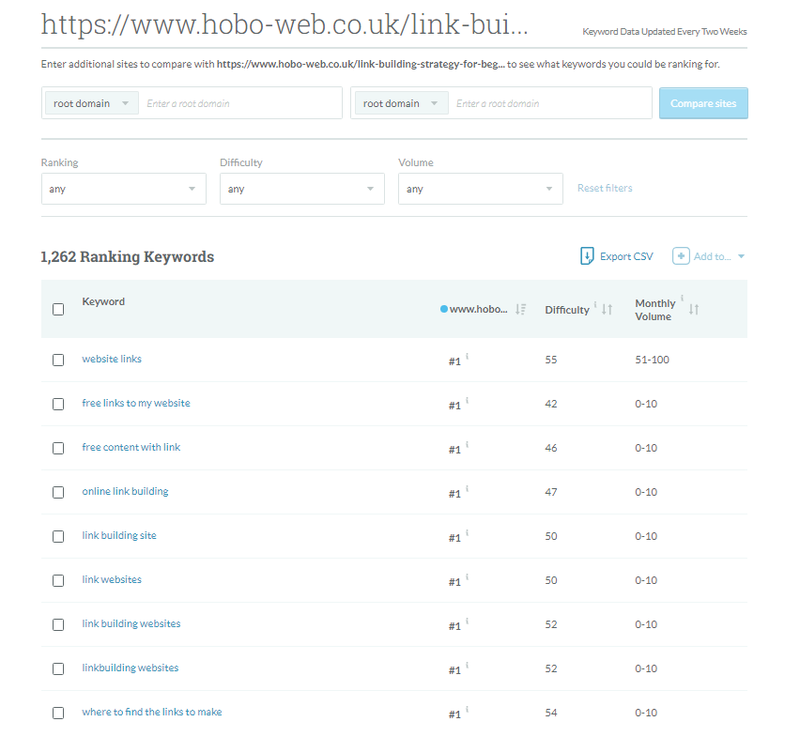 By using this feature, we have now found several long-tail keyword combinations that we can use to structure our content using subheadings and most importantly, the title tag. I suggest you analyze between 5 and 10 pages and make a list of keyword combinations with their monthly search volumes. You should come up with minimum 25 keywords and try to work on which describe and relate to your content best. If your content has high-value material about any of these topics, It is likely that your content will rank for these combinations as well. Another benefit for long-tail keywords is that your content might take a long time to rank for your main keyword but there is less competition for long-tail keywords and you will start seeing the rankings sooner for these. Quote: Long tail keywords are the search queries with very low individual search volume, but an enormous total search demand as a group. The name comes from the “long tail” of the so-called “search demand curve” — a graph, that plots all keywords by their search volumes. If your content suits it (e.g. you have evergreen content on your site), I find success adding the year to some titles help boost searches at the turn of the year. You need to be on top of this strategy year to year though, or you risk making your content OUTDATED (the opposite of what you want). Still don't forget that you have to keep your title lenght between 60 -70 characters. Experiment and test your Title on tools such as Moz | Title Tag Preview Tool and SISTRIX | SERP snippet generator to see how they appear in Search Engine Reult Pages(SERPs). QUOTE: "Avoid unnecessarily long or verbose Titles, which are likely to get truncated when they show up in the search results." Your Title should accurately describe the content that follows it. Your Title is an introduction, get it right and be honest about it. Your Title is more like a claim about what your content has to offer. No one likes false claims. If you are honest, you will be rewarded by your readers by backlinks and social shares and even direct business. Another important reward is your readers will stay on your page for long because they found what they were looking for when they clicked your Title in search results. Longer they stay and read, better is your bounce rate. Better bounce rate means more traffic as Google can see your content adds value to visitors experience. Does your content talk about best practices? Does your content relate to content marketing and digital marketing? Does your content overlap content marketing and digital marketing? What is added value in reading this content Will visitors learn more about both topics after reading your content? Ask questions on similar lines and come up with terms honestly explaining how your Title talks about both topics? Write them all do. WE will need them soon!! Make sure to include your primary keyword(s) in the start of the Title tag, followed by a secondary keyword(d) and complete it using the natural combination of words to achieve long-tail variation. For this example, I will take "content marketing" and "digital marketing" keywords and combine them to form the draft Title. No Title is the best tile and many could qualify for the driving seat. The key is to research your competitors, thinks as long as it takes and try to come up with a few drafts Titles. Visualization is a great way to factor in the human element which is most important for click-through rate (CTR). The best way is to make a few samples and present it to a few audiences (colleagues, friends and family) and get a vote. At the end of the day, your content is for humans not search engines. Natural feedback is way more accurate than other forms of testing. 6 months is a brief period in the life time of a webpage and the time and effort needed, to reap the rewards in terms of traffic the long run, are totally worth it. Be patient, the pages which reach top three for high voulume search keywords can make or break your websites. Remember to fucus on describing your content in the title accurately and concisely. while doing so, including your keywords which have high search volumes and most importantly, relate to your content. Google Algorithms work for both, the searchers on their portals and content creators, providing those searches with content. Every human mind is unique and different in using the language to express what they-they want. Google has worked heavily to infer searcher intent from all possible combinations they use in search boxes. On the other hand, most content is not so technical and is about natural, everyday life topics. It is created by human beings using natural language. Google has worked extensively to infer from naturaly written content, what it is about. If your content does not what it says on the tin, Google can figure out. How do we meet all that? Several Google searchers might look for the same thing for completely different reasons. For example, someone might be looking for "HTML Title Tag" for the sake of curiosity. Someone else might be searching this very term as part of their learning process as to how to make their website rank higher by focusing on SEO. For the former searcher, a brief article would be the right read. But for the later, hopefully, this very article I have written may help. First searcher ending up on this page will probably scroll fast and say "Oh my days" and exit. Second type os visitor, may well spend some time and read through more and might even bookmark this page to read later. How do we make it clear to both readers what kind of article is this about "Title tags" anyway? Match your description of the reason for their search and tell them. Meet their expectation by telling them what to expect. My article is definitely about the second type of reader (Though it can serve the purpose well for the first type). It would greatley help if I may add further descriptive words to introduce my Title like “ultimate,” “complete,” “Tips,” “Rules,” “step-by-step,” etc to let them know how detailed my content is going to be. Make things clear to your readers. This helps. All these sample Titles give out some idea to the searchers as what to expect in terms of length of the content when they click your Title. Everyone is busy and everyone loves posts as a compiled List. If you have an article that is a compilation, let readers know about it by informing them using a quantifier. Lists are not only a good read, Titles introducing lists have a higher click-through rate (CTR) as well. Thin content is not always a bad thing. If you have something to offer to your readers which is unique, thin content will not stand in your way to achieve rankings. Straight to the point, SEO guide. You can use free tools like thesaurus to see what words can be used as a Title. Before you create your Title, do not forget to check their search volumes.us.com) to see what words can be used as a Title. Before you create your Title, do not forget to check their search volumes. If your content is relevant to the current times, speak about this quality in the Title. In this day and age, information and knowledge become outdated very quickly. Fresh ideas, information and knowledge are what everyone is after. It's better and even right thing to do to precisely mention it in your Title. Consider Google Algorithms, which are smarter now than they were 5 years ago in 2013. If we are writing about a Google Algorithm update which is very recent, what title would suit better? Google has an update multiple times a year, every year. The second Title not only mentions what it is about but also the year the product was released and written about. A searcher who doesn't know when was the update will understand, it is one of the very recent. Another very good reason to add Dates in your Title is to keep it up to date and not lose traffic over time. If you have written a piece of content which is in detail and adds value, It should remain on top of the rankings if it is still relevant. The best way to do is review it on frequently (at least once a year), remove content which might be obsolete and update it accordingly. If you revise and update your content every year from 2016 to 2018, All you need to do is update your Title tag and your page can carry on rankings it holds and attract clicks without having the need to write a new from scratch every year. I always aim to keep my HTML page Title elements relatively simple, and looking as human-generated and unique, as possible, although it is easy to end up stuffing keywords in there. We are human beings. Your target audience are human beings. We have emotions and we are driven by them most of our days and lives. Emotional Titles work, definitely. But are they beneficial in the long run? It depends if your content lives up to your Title. If you are running a viral website, maybe this technique will work for you but most websites are not viral. You have to be very very careful with pages which are technical and educational. This may get people to click your Title, but if your Title is dishonest it will suffer. And we know now, honesty is the best policy in the long run. This doesn't mean you should not rule them out altogether. You should consider following before you make your decision. Do your subtitles form a unique pattern? Does your content offer something that is going to make a day for someone? If you think it does, go for it. If the answer is no, better stick with a standard format rather than being dishonest about it. Titles invoking curiosity are win-win for clicks. No doubt about that. But these Titles are fundamentally against the "Honesty is the best policy rule"
Curiosity titles don't serve these purpose from any dimensions. I would certainly avoid these. If your have product or service pages among many which perform better, It's worth spending time on them and experiment how these could be further improved. Best way to go for it is to research your competitors who are performing btter than you in Search results. Get tips from there titles and test if new titles bring any positive difference in rankings. Disclaimer: “Whilst we have made every effort to ensure that the information we have provided is accurate, it is not and advice. We cannot accept any responsibility or liability for any errors or omissions. Visit third party sites at your own risk. This article does not constitute legal advice.